Winning in Omaha - Jack A Stark, Ph.D.
Dr. Jack Stark, a long time performance psychologist in Omaha, has put together quite a resume. Not only was he the performance psychologist for the Cornhusker’s dynasty from 1989-2004, but he also has worked with Hendricks Motorsports since 2000. He was instrumental in Doug McDermott’s 3000 point college career and has been part of 20 national championships. 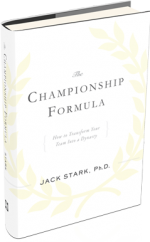 His book, The Championship Formula, explains how any organization can consistently achieve extraordinary results. Dr. Stark also gives back to Omaha by offering free counseling to Omaha high-school students as well as serving as a director on the Gilbert C. Swanson Foundation, a Non-Profit corporation.